Looking for a fun and inexpensive way to jazz up your next family gathering or birthday party? 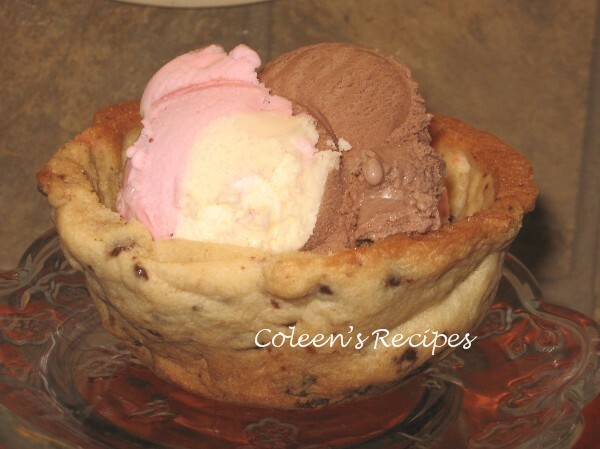 Try these cookie bowls. 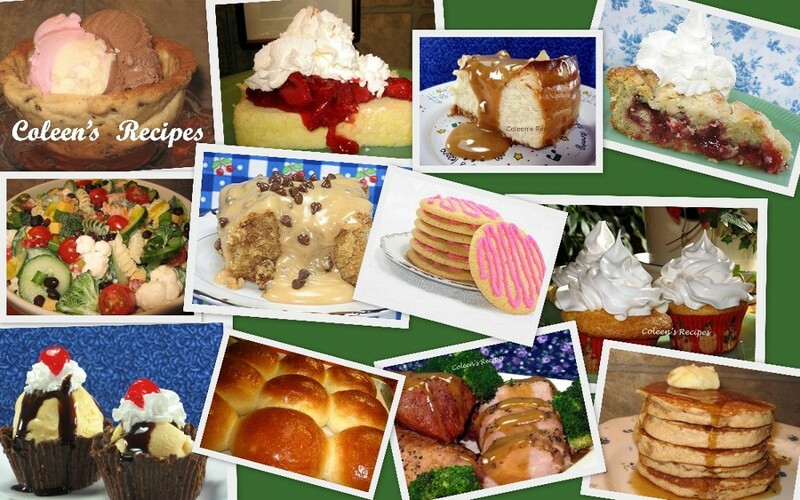 Not only are they easy to do, but you can fill them with anything from pudding to ice cream. 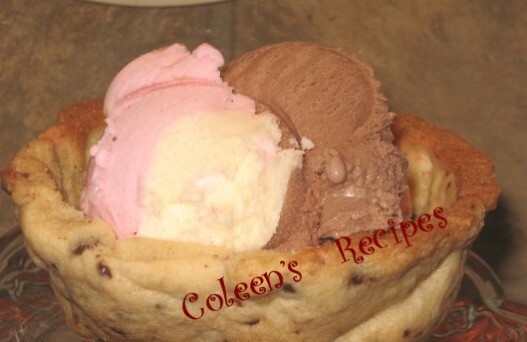 The bowls can be baked ahead of time and frozen (unfilled); there are tons of possibilities. The instructions for these cookie bowls call for forming them over an inverted cupcake pan, however, I wanted bigger (and thicker) ones because they were for a specific purpose and had to be strong enough to travel well, so I formed them over an inverted Texas size muffin pan. THIS RECIPE CALLS FOR HALF SHORTENING AND HALF BUTTER. DO NOT BE TEMPTED TO SUBSTITUTE ALL BUTTER, IT WILL NOT WORK !! IF YOU USE ALL BUTTER, THE DOUGH WILL SAG AND SPREAD ALL OVER THE PLACE AS IT BAKES. I HAVE BEEN TOLD THAT COMMERCIAL REFRIGERATED COOKIE DOUGH DOES NOT WORK EITHER (IT ALSO SPREADS). Beat together shortening, butter and sugars in a large bowl; add the egg and vanilla and beat until well mixed. 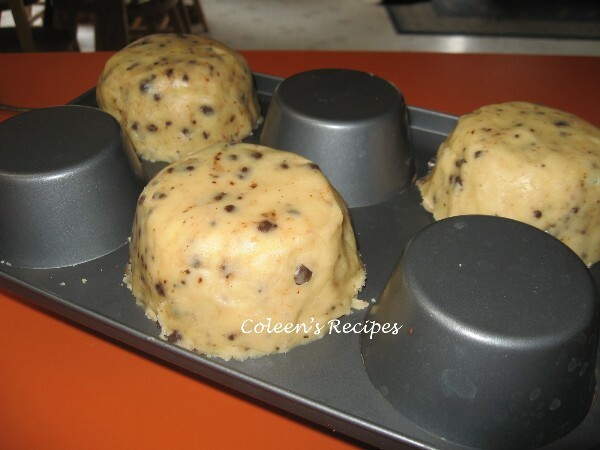 Add the flour and baking powder and mix well then stir in the miniature chocolate chips. Put batter into a large plastic bag and flatten into a disk; chill for about an hour. Preheat your oven to 375°. Turn your cupcake (or muffin) pan upside down and cover every other cup with foil. NOTE: standard size cupcake pan requires a 4" circle of foil and the Texas size muffin pan requires a 6" circle of foil. Spray the foil lightly with vegetable spray. NOTE: I used the new no stick foil and didn't have to spray it at all. 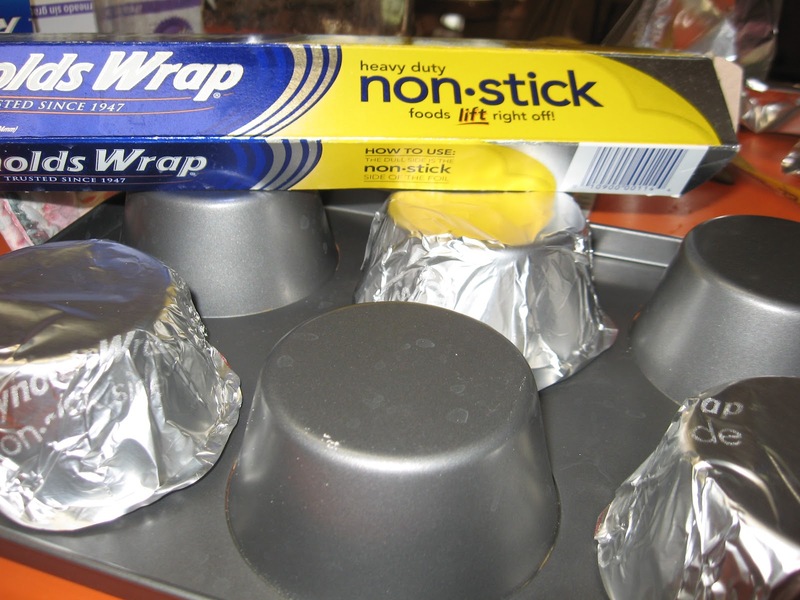 NOTE: If you are using a standard size cupcake pan, you can use full size paper cupcake liners instead of the foil. Roll the chilled cookie dough (between two pieces of waxed paper) out to about 1/8th inch or about the same thickness as pie dough. Cut circles and drape over foil, smoothing wrinkles and/or cracks in the dough together and trimming to fit. Bake 10-12 minutes or until light brown. Remove from oven and let them COOL ON THE PAN FOR 10 MINUTES BEFORE TRYING TO REMOVE THEM. After 10 minutes, gently lift them off of the pan (use the tip of a butter knife to lift one corner of the cookie bowl first) but DON'T REMOVE THE FOIL FROM THE INSIDE OF THE COOKIE BOWL UNTIL IT IS COMPLETELY COOLED. What a fun idea. I can think of many ways to use these. Thanks for sharing. These look like something my kids would absolutely love! How many Texas size bowls did you get out of this recipe, Coleen? Just three? To Nancy: I got 6 big bowls, but the recipe makes 10 regular size bowls. WHat a great little idea! The possibilities are just swirling in my head! i did this , and i added way to much cookie dough to the first pan.my next try i will put a little less on them and see how it goes! the cookie crumbs were great though! I'll be making these for Fathers day, but I'll use a sugar cookie recipe & fill with berries & topwith whipped cream. I saw this on Pinterest and thought I would try it just from the picture. I did not read your post first:( I used my own cookie recipe and put it over a muffin tin. The bowl worked but the cookie spread a lot on the bottom so I did not have nice little edges like you. Do you think it was the recipe or the fact that I did not chill the dough first? Since cookies normally spread how do you keep this from not spreading? Thanks for helping me. Tiffany: I'm guessing your cookie recipe is made with butter. Butter makes cookie dough spread. If you use shortening (I use butter flavor shortening) the cookies will not spread when you cook them. People freak out about using shortening in cookies, but in all reality shortening has HALF of the saturated fat of butter. Thanks for answering Tiffany's question! I had the same issue when I tried this...the dough expanded waaay more than I planned for, dripped down all over the oven, it was a total disaster. I'm definitely going to try again with your recipe. :) And the aluminum foil is genius! can't wait to try again! I just tried and butter is indeed the enemy here, lol. Is there anyway it can be made with store bought refrigerated dough or the bag dry mix? I made this after seeing your post. My family really enjoyed it! And they thought I was creative...I had to say I saw it on pinterest:) Thank YOU! So, I'm confused about the note here. It says not to use "ALL the butter" but doesn't specify how much butter to use instead. Why even include the 1/4 cup amount in the recipe if you're just going to add a note saying not to use a 1/4 cup after all? To Anonymous: If you will re-read the instructions, it says not to use butter only (recipe calls for part shortening and part butter). Some people don't like to use shortening, so they want to use ALL butter, but doing that will make the cookie dough sag while baking. Where did you get the red snowman cupcake holders? So does premade cookie dough such as TollHouse not work?? I made them today! I used my own choc chip cookie recipe, because I am used to it. They look great! I can't wait for our kids to fill them with ice cream! I tried these and then dipped the rim in melted chocolate let it cool added vanilla ice cream and strawberries or raspberries...yummy!!! Thank you for sharing,my 3 1/2 year old grandson will love making and eating them!!!! He is the next Bobby Flay you know!! I can't wait to try these and Joy's idea sounds fabulous! Do you have a sugar cookie recipe that will work with these? This is the most amazing idea!!! I've never seen this before! Incredibly brilliant! My son is going to love this! Shortening can be found in the baking section of any grocery store. I comes in a can. the definition of shortening is: an edible fat used to shorten baked goods. I hope that helps. You may know it as Crisco. Just finished my first attempt with Pillsbury sugar cookie dough Many of them are fine. I learned alot and will keep practicing. They are darling. Will fill them with unbaked cheesecake and cherry pie filling. So creative, thanks. I loved the idea! Made these today very cute they tasted just ok for me but it is something different! these cookie cups are darling. I remember when I was younger that my mom used lard in baking. Needless to say, that was many, many years ago. I also thought about using the foil cupcake lines in place of cutting circles from my foil. How cute these would be making mini ones; when cool, dip the rims in chocolate and adding a peanut butter cup or other candy and just putting in microwave for a few seconds just until the candy begins to soften and top with a marshmallow. What a sweet candy treat these would make. I tried making this today and my dough was really crumbly. It seemed as if it wasn't wet enough to absorb all the dry ingredients. So from there, nothing else worked. I checked and re-checked the recipe. Any suggestions? I really want to make these right for my son's birthday. Carrie: I've used this recipe for decades and have never had a problem with it. Did you change any of the ingredients? I saw this on Pinterest and tried to make it. I thought it would be easy but I have tried twice, but were unsuccessful. Since I am not a baker, I used store bought dough. Both times, the dough spread and dripped into the bottom of my over. Any suggestions? To Anonymous 7/1/2016 If you read all of these comments, you will see where you went wrong. This WILL work if you use THIS recipe, exactly as it is written.